Former Mariners high performance director Dr. Lorena Martin, fired in November, denied the team's allegations. "The Mariners are fabricating a termination rationale to avoid their contractual obligations," she said. The Mariners claim former high performance director Dr. Lorena Martin had been the subject of complaints by team trainers and other employees about her competency and trustworthiness months before she sued the team accusing it of racial and gender discrimination, according to a formal arbitration request. The team’s letter requesting private arbitration had been confidential and only became public Friday when Martin’s lawyer, Robin Phillips, filed a motion in King County Superior Court asking it to quash the Mariners’ attempt to have the case heard by an arbitrator. The weeks-old letter was included as an exhibit to the motion and offers the first detailed glimpse at what the team’s lawsuit defense might entail. The Mariners placed Martin, whom they were paying $300,000 annually over three years, on paid leave in October. Then, after Martin took to social media on Nov. 12 complaining of gender and racial discrimination by Dipoto and other team officials, the team fired her with cause three days later. Reached Friday, Martin vehemently denied the allegations in the team’s letter. “The Mariners are fabricating a termination rationale to avoid their contractual obligations,” she said. Martin last week filed a wrongful termination lawsuit alleging discrimination by top team officials. 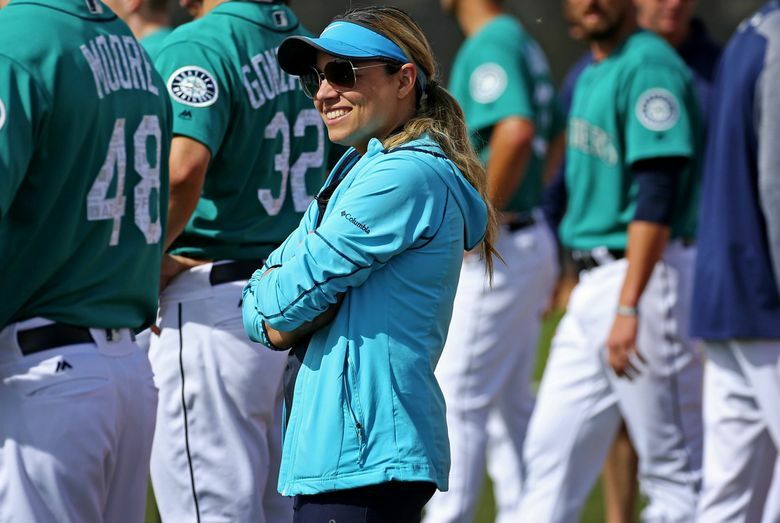 It stated that Dipoto, manager Scott Servais and player personnel director Andy McKay had made disparaging remarks about Latino players and had mistreated her as a Latina and a woman. Martin previously stated in the lawsuit her relationships with Dipoto, McKay and Servais began spiraling within weeks after her widely-publicized November 2017 hiring. Her lawsuit states that Dipoto called her a “cocky Latina” and McKay called her “stupid” in a January 2018 meeting, and that Servais and Dipoto had made disparaging remarks about Latino players in subsequent meetings that month. Martin’s lawsuit states that she told Mariners owners John Stanton and Buck Ferguson and CEO Kevin Mather in March about the alleged mistreatment. The Mariners have vehemently denied Martin’s allegations, but had not elaborated on the reasons behind terminating her with two years left on her deal. The Mariners claim that employees told them Martin had created “a hostile work environment’’ and threatened to fire them if they went to Dipoto about player medical or other issues. The letter says the team, as a result of “overwhelming and accumulating’’ employee complaints, launched an independent investigation into her conduct in which approximately 20 people were interviewed. It states that as a result of initial findings corroborating the complaints, she was placed on paid leave and invited to speak directly to investigators. The team’s letter adds that Martin’s social media comments in November complaining of discrimination “breached her agreement to make no public statements’’ and was done to deliberately harm the team through “inaccurate and false’’ statements. It says the team decided to fire her based solely on “poor performance and inappropriate conduct’’ after her refusal to cooperate with the investigation and the social media breaching of confidentiality. Martin’s lawsuit had stated that after she was placed on leave, the team had offered her a choice between accepting a small percentage of her remaining salary or cooperating into the investigation of her conduct — which she felt was a pretense to firing her. As for Martin’s discrimination allegations, the team’s letter states that: “no indication, much less evidence of such was identified during” interviews with people “who were in a position to know.’’ It states that Martin repeated her discrimination allegations to MLB’s head office the same day as her social media postings. The Mariners have asked that an arbitrator void the remaining $600,000 left on Martin’s contract through October 2020 and that further financial damages be awarded the team as compensation for her “defamatory’’ statements. Martin’s lawyer, Phillips, argued in court documents filed Friday that any arbitration provisions in her client’s employment agreement with the Mariners are void under Washington law because the discrimination complaints require the case to be heard in open court. Phillips wrote that having the lawsuit and arbitration cases proceed concurrently could lead to “inconsistent results’’ and potentially undermine her client’s rights.